Trade mark of UK company Alley & MacLellan Ltd, Sentinel brand Jan 1949. Sentinel Waggon Works Ltd was a British company based in Shrewsbury, Shropshire that made steam-powered lorries, railway locomotives, and later, diesel engined lorries, buses and locomotives. Sentinel DG8, Beamish Steam Fair. Alley & MacLellan was founded in 1875 and was based in Polmadie, Glasgow. This company continued in operation until the 1950s. Initially manufacturing valves and compressors for steam engines, and later whole steamships, Alley & MacLellan acquired Simpson and Bibby of Horsehay, manufacturer of steam powered road vehicles, in 1903. They began producing steam road vehicles in 1905 and in 1906 introduced a 5 ton vertical-boiler wagon, which featured a 2-cylinder undertype engine and chain drive. Around 1915 Alley & McLellan moved the steam wagon production to a new factory in England and it continued under a separate company (see below)., and in 1918 the company also opened a third factory in Worcester specialising in valve manufacture. Both factory buildings were prefabricated in Glasgow for local assembly and in both cases core Scottish employees transferred to the new sites. Alley & MacLellan continued to operate in the original Sentinel Works in Jessie Street, Glasgow until the 1950s. They produced a wide range of engineering products including compressors, valves, etc. The 'Sentinel' name continued to be used for the products of the original Glasgow works until the mid 20th Century. A new company Sentinel Waggon Works Ltd was formed when steam wagon production was switched to a new factory, opened at Shrewsbury in 1915. There were several other slight changes to the name over the company's lifetime when further infusions of working capital were required to obviate financial problems. Alley & MacLellan's early wagon was so successful that it remained in production with relatively few updates until the launch of Sentinel's famous Super in 1923. The company also produced steam railway locomotives and railcars, for railway companies and industrial customers. In 1917, the company was bought by William Beardmore & Co., Ltd.
Sentinel locomotive on the Buenos Aires Midland Railway in Argentina (1932). In 1920, after financial problems, the company was reorganised as Sentinel Waggon Works (1920) Ltd. The Sentinel 'Super' model that followed in 1923 was assembled in a radical new plant at Shrewsbury, with a flow line based on Henry Ford’s Model T factory at Highland Park, Michigan, with 1,550 vehicles produced. 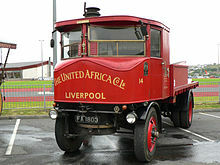 Sentinel, along with Foden, dominated the steam market, but the 1930s saw the demise of both companies' ranges as new legislation forced the development of lighter lorries, Sentinel surviving the longest. In 1934 Sentinel launched a new and advanced steamer – the S type which had a single-acting 4-cylinder underfloor engine with longitudinal crankshaft and an overhead worm-drive axle. Their Sentinel Waggon Works' design of 1935 led to the production of 3,750 Sentinel 'Standards' in the seventeen years that followed, the biggest selling steam lorry ever. It was lighter and featured a modernised driver's cab with a set-back boiler and was available in four, six and eight-wheel form, designated S4, S6 and S8. In spite of its sophisticated design, however, it could not compete with contemporary diesel trucks for all-round convenience and payload capacity, and was phased out in the late 1930s. It was not the end of Sentinel's involvement with steam, however; the company built about 100 "S" type vehicles for export to Argentina as late as 1950, for use by the Río Turbio coal mine. It has been stated that Sentinel were never paid for the last batch of the Río Turbio production run. At least two of the Río Turbio waggons survive in Argentina to this day. In 1946 Thomas Hill's signed an agency agreement with Sentinel for repair and maintenance of diesel vehicles. In 1947 Sentinel offered to extend the agreement for diesel vehicles to include the steam locomotives and an agency was accepted by Thomas Hill for sales and servicing. In 1947 the company became Sentinel (Shrewsbury) Ltd, and had developed a new range of diesel lorries. Despite Sentinel's superbly engineered vehicles, sales diminished throughout the 1950s, and by 1956 the company was forced to cease lorry production. The factory was acquired by Rolls-Royce for diesel engine production, and the remaining stock of parts and vehicles was taken over by Sentinel's chief dealer, North Cheshire Motors Ltd of Warrington, who formed a new company, Transport Vehicles (Warrington) Ltd, in 1957 to produce Sentinel-based designs under the TVW name. In 1963 Thomas Hill's decided to renew the loco agreement and relinquish the diesel vehicle agency, concentrating all efforts on the steam locomotive work. An 0-6-0 outside crank Sentinel Derwent at Lafarge Hope Cement Works in 2008. Despite the various interesting developments, Rolls Royce did not consider railway locomotives to be part of their core business. They had agreed to complete all steam locos on order, and four steam receiver locos ordered by Dorman Long in 1956, but only after much consideration did Rolls-Royce finally agree at the end of 1957 to design and build a diesel locomotive of similar weight and power to the 200 hp (150 kW) steam loco that had sold so well. Thomas Hill's would assist in the design and development of these diesel machines and would be the sole distributor. In 1958 the last two Sentinel steam locos were delivered marking the end of an era. Two of the newly developed steam receiver locos were delivered and proved very satisfactory in service, but Dorman Long were not happy. There had been a change of heart among their engineers as well as a change of circumstances, and they were now favouring diesel locomotives. The last two steam receiver locos were built but never delivered and ultimately all four were converted to diesel hydraulic. The prototype Sentinel diesel locomotive was built and ready to commence trials on the former Shropshire & Montgomeryshire Railway (then under military control) early in 1959. It met with the approval and enthusiasm of the Company's prospective customers and before the end of the year 17 locomotives had been sold and delivered. The company was ready to produce a maximum of four locomotives a month. By 1963 four different Sentinel diesel models were being produced, commencing with the 34 ton chain drive 0-4-0 powered by the Rolls-Royce C6SFL six-cylinder engine of 233 bhp (174 kW) (gross) (later uprated to 255 bhp (190 kW)). This was followed within a year by a 48-ton 0-6-0 rod coupled machine, fitted with a Rolls-Royce C8SFL eight-cylinder engine of 311 bhp (232 kW) (gross) (later uprated to 325 bhp (242 kW)). Between 1963 and 1966 a fleet of these diesel locomotives, eventually numbering five 0-6-0s and 18 0-4-0s, was supplied to the Manchester Ship Canal Company for use on the navigation's private railway network. These Sentinels demonstrated their suitability for heavy work, but heavier and more powerful locos were called for, particularly by the steel industry, and before the end of 1963 a 74 ton 0-8-0 powered by 2 x C8SFL engines and a 40-ton 0-4-0 fitted with a C8SFL engine had been added to the range. A shaft drive 600 hp (450 kW) 0-6-0 machine was now being developed at Shrewsbury using the new DV8T engine. Considerable interest in this loco was expressed by Stewart and Lloyds mineral division at Corby who were operating more than 20 steam locos, mainly of the Austerity type. This new locomotive Steelman was eventually delivered to Corby in late 1967, about two years overdue. The prototype locomotive proved satisfactory and three more were ordered by Stewart and Lloyds and one by Richard Thomas and Baldwins, Scunthorpe. Stewart and Lloyds' programme to replace more than 20 steam locos over the next few years the future for Steelman looked good. British Railways offered Stewart and Llords 26 second-hand Swindon-built class 14 diesel hydraulic locomotives. The rod-coupled Class 14 were powered by a 650 hp (480 kW) Paxman engine with Voith Transmission and were capable of doing the work required at a fraction of the price of new Steelman locomotives. No further "Steelman" locos were built at Shrewsbury. In 1979, ICI Billingham wanted two heavy locomotives to replace their ageing Yorkshire Janus locomotives. Their engineers visited many industrial sites, and steelworks in particular, to evaluate available locomotives. Their requirements were discussed with varios UK locomotive manufacturers, and they ordered an updated version of the Sentinel Steelman design. Two machines were delivered toward the end of 1981. UK sales of Sentinel locos were now fewer than 10 per year, their only overseas success had been to license the assembly of 36 0-6-0 locomotives by Sorefame for the Portuguese Railways in 1965/66. These locomotives became the CP Class 1150. The locomotives and railcars (with a few exceptions) used the standard steam lorry boilers and engine units. Works no. 6520/1926, "Toby" 0-4-0VG; Port of Par, Cornwall. (Replaced 1876 Manning Wardle 0-4-0ST "Punch". Replaced by Bagnall 0-4-0ST "Alfred" and "Judy"). In 1925 the New Zealand Railways Department bought one Sentinel-Cammell steam railcar which became part of its RM class. Between 1925 and 1932 the London and North Eastern Railway bought 80 Sentinel steam railcars and four were supplied to the LNER-controlled Cheshire Lines Committee. In 1928 Palestine Railways bought two Sentinel-Cammell articulated steam railcars for local services. Each unit had two cars articulated over three bogies. Palestine Railways found the railcar format inflexible, as if passenger numbers exceeded the capacity of a train it was not practical to couple up an extra coach. In 1945 PR removed the Sentinel engines and converted the railcars to ordinary coaching stock. In 1933 the Southern Railway bought a Sentinel-Cammell steam railcar for use on the Devil's Dyke branch, in East Sussex. Although operationally successful, the single railcar was not large enough to meet the needs of this line. It was transferred away from the line in March 1936 and tried in other areas, but was withdrawn in 1940. In 1935 the Ferrocarril Central del Paraguay (Paraguay Central Railway) acquired three oil-fired railcars with trailers for the suburban service between Asunción and Ypacarai. In 1951 Egyptian National Railways bought 10 articulated steam railcars. Each had three carriage bodies articulated over four bogies. One is preserved by the Quainton Railway Society at the Buckinghamshire Railway Centre, England. A special locomotive was produced at Sentinel, for Dorman Long and named "Princess". It consisted of 2 x 0-6-0 chassis coupled together to articulate. One unit carried the cab, a 5 drum oil-fired Woolnough boiler and two 100 hp (75 kW) engines. The other unit housed the water and fuel tanks and also two more 100 hp (75 kW) engines providing a total of 400 hp (300 kW). It was considered a magnificent machine by the staff but unfortunately was the only one of its kind ever built. Another special was the NCB Gyro or Electrogyro Locomotive. Based on a 200 hp (150 kW) 4-wheeled 0-4-0 frame fitted with two "gyro units" (see Flywheel energy storage) made by Maschinenfabrik Oerlikon of Switzerland. The gyros were principally a 3 ton horizontal flywheel enclosed in a vessel filled with low pressure hydrogen. A vertically mounted three-phase squirrel-cage electric motor/generator was directly coupled to each flywheel shaft. The motor took its power from a side-mounted supply at static posts via a four-contact swinging arm extended or retracted pneumatically by the driver. Power could only be taken whilst the loco was stationary alongside one of these posts. When the gyros had reached the required speed, the driver would retract the contact arm, switch the motor to generation and controlled the locomotive in a similar way to a diesel-electric loco. Charging posts had to be strategically placed around the site. A contact arm was provided on each side of the locomotive, although it is not clear if posts were installed on one or both sides of the track. Each gyro operated between 3,000 rpm when fully 'charged;' and 1,800 rpm before recharging. Recharging took 2​1⁄2 minutes and the locomotive could work for around 30 minutes before recharging. It weighed 34 tons and had a maximum speed of 15 mph (24 km/h). This machine was specially built for the National Coal Board (NCB) at Seaton Delaval. The intention was to investigate the use of gyroscopic storage as a potential method for a flameproof and emissions-free underground locomotive. It operated from 1958, very satisfactorily, but was eventually taken out of service because of site development and its restricted field of operation. In April 1965 it was converted for the NCB to a diesel hydraulic machine. The Receiver Locomotives were another special type built just for Dorman Long and were based on the idea of a Fireless locomotive. A number of Sentinel steam waggons and tractors exist in preservation in the UK—about 117 as of 2008. They are often shown at steam fairs in the UK. For more information see the Sentinel Drivers Club website. A number also exist in Australia and other countries. There are several surviving steam locomotives located at various heritage railways around the UK, including: the Elsecar Heritage Railway, the Middleton Railway, the Foxfield Light Railway and the Chasewater Railway. Standard gauge, 4-wheel, vertical boiler, geared tank locomotives (4wVBGT), unless otherwise stated. Sentinel #8398 – ex SPR No. 166 and EFSJ #166; kept its numbering after 1960 at FNV and continues as No. 166. Sentinel #8399 – ex SPR No. 167 and EFSJ #167; kept its numbering after 1960 at FNV and continues as No. 167. Sentinel #8400 – ex SPR No. 168 and EFSJ #168; kept its numbering after 1960 at FNV and at Amsted Maxion. After an unsuccessful attempt to convert it to diesel power, it was withdrawn and was scrapped at the plant's facilities. ^ Cassier's Magazine. L. Cassier Company, Limited. 1905. p. 500. ^ Julian Holland (1 May 2012). Amazing & Extraordinary Facts Steam Age. David & Charles. pp. 128–. ISBN 1-4463-5619-1. ^ Kennedy, Rankin (1905). "Sentinel" Air Compressors. The Book of Modern Engines and Power Generators. Vol VI. London: Caxton. pp. 132–140. ^ "Railways of the Far South". Archived from the original on 19 September 2009. ^ Thorpe, Don (1984). The railways of the Manchester Ship Canal. Poole, Dorset: Oxford Pub. Co. pp. 140–146, 185. ISBN 0860932885. ^ "Restoration of Sentinel STC6-44 bus ODE182". Retrieved 15 June 2012. ^ Andy Chapman. "Sentinel Steam Loco 7109: A Warm Welcome!". Sentinel7109.blogspot.co.uk. Retrieved 6 August 2012. ^ Casserley, H. C. (28 January 2007). "Sentinel railcar at The Dyke Station in 1933". Subterranea Britannica (Disused Stations). Retrieved 14 August 2009. ^ "Sentinel-Cammell Steam Railcar No. 5208". Quainton Virtual Stock Book. Buckinghamshire Railway Centre. 11 April 2008. Retrieved 14 August 2009. ^ a b c d "N.C.B. Electrogyro Locomotive". The Railway Magazine: 421. June 1958. ^ "sentinel-waggons.co.uk". sentinel-waggons.co.uk. Retrieved 12 August 2012. ^ "UK & Ireland Heritage Railways – Locomotives Database". Heritage-railways.com. Retrieved 12 August 2012. ^ "Transporte das Locomotivas Sentinels". ABPF - Regional Sul de Minas. 2015-08-28. Retrieved 2016-12-27. Bradley, D.L. (1975). Locomotives of the Southern Railway, part 1. London: Railway Correspondence and Travel Society. ISBN 0-901115-30-4. This page was last edited on 4 March 2019, at 20:08 (UTC).